If you love the idea of taking your pooch to freely frolic off-leash in a super-secret desert spot but dread the thought of how she travels in the car (panting, whining, drooling, vomiting – BLECK!! ), don’t be put off just yet. 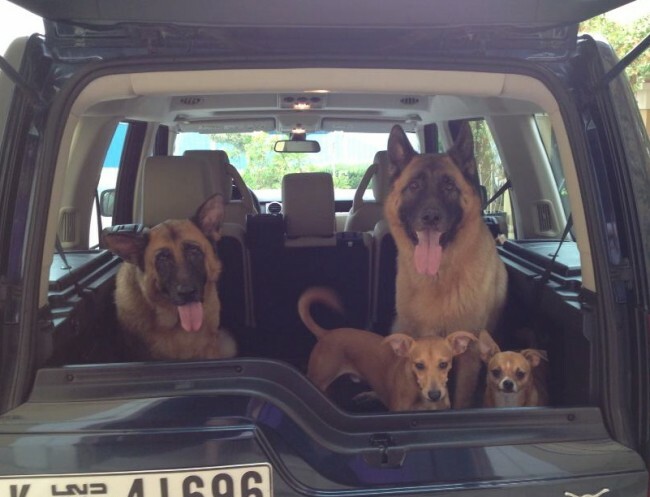 Or maybe you’ve got the all important, annual car ride to the vet or drop off at your favourite Dubai kennels? Her fear of cars or car sickness could be from the funky sensation she feels while traveling in a car (dogs can get motion sickness too!) or she’s simply not accustomed to the adventure. But, there are a few tricks that you can try to help her overcome her aversion to car rides. Firstly, it all starts with training her to ride in the car. For some pups, the stress of the car ride itself is what makes them sick, so a bit of training and some management may solve the problem. A dog that is afraid of or nervous around cars may need a little help from her human to become more at ease with cars through counter-conditioning, which means desensitizing her to the car (make the car more familiar to her through interaction). Begin by selecting a command phrase “GOOD CAR!! !” (or a clicker), then praise and treat her for looking at the car. If she’s really nervous, you may have to start several feet away from the car before she’ll feel comfortable enough to take the treat. Eventually, move closer over the course of several training sessions when she feels more relaxed (yup, several… this will take some time, folks). When she’s able to look at the car without breaking down into a nervous fit, you’ll need to train her to enter the car on her own. Get right next to the car, open a door and reward her for any movement toward the car. And when she’s jumping in and out, you can put a new command word, such as “load.” When she’s mastered the art of "loading", work on getting her to stay in the car for longer and longer periods: play in the car, feed her meals in the car (anything that will associate the car with good things). Aaaaannnndddd… you’re off!!! OK, well maybe not for a huge ride, but a swing around the block is a great way to start. Now once you’ve got her used to the idea that the car is a pretty cool place to be, you’ll need to practice, practice and… practice some more! Dramamine: A motion sickness pill for humans that can be given to dogs too. Be certain to ask her vet about the dosage. Security: Placing her in a car seat or crate means she be jostled around less and feel more secure. No Food! : There’s less to throw up from an empty stomach! Water: Just like people who get nauseous, having water available may help. Fresh Air: Leave windows cracked open a little to provider her with fresh air (or crank up the air-conditioning). Give Her a Break: Take frequent stops, let her out and give her a break! Above all, try to make it fun ~ dogs really like fun! And be aware of the temperature and noise level in the car (avoid rocking out to Nirvana with her head right by the speaker!). Read about Collection & Delivery at DKC.